TOMS.ca is having a End of Year Sale. 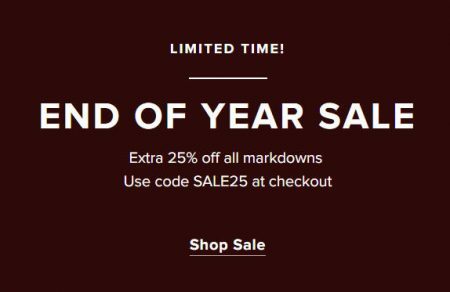 Save an extra 25% off all markdowns when you enter the promo code SALE25 at checkout. I’ve tested the code and can verify that it works. The promo code is available online-only until Thursday, December 28, 2017 at 11:59pm PST. Hurry, quantities are limited so shop early for the best selection. Extra 25% off select items from TOMS.ca from 12:00 am PST on December 21, 2017 through 11:59 pm PST on December 28, 2017. Offer only applies to sale items (located at www.TOMS.ca/sale). Offer does not apply to gift cards, taxes, shipping or any other fees. Cannot be combined with other promotions, offers or discounts (other than any shipping promotions that may be in effect). Offer not valid on previously purchased merchandise. Please enter promotion code SALE25 upon checkout. Offer is subject to adjustment due to returns, cancellations or exchanges. TOMS Shoes, LLC reserves the right to extend, modify, or discontinue these offers at any time. TOMS.ca offers free shipping on orders of $70 or more. Click here to shop TOMS.ca now or for more details.